This two-part series on clothing security and the use of anti-theft tags stemmed from an article I viewed about a shoplifter fleeing from police and crashing her car. In the suspect’s vehicle were two televisions she had stolen from Walmart and a pair of stolen jeans. I mentioned that I did not know if the televisions had security devices on them but if the jeans came from the same store I was fairly certain no Sensormatic tags were used on them. My lead up was to the dangers shoplifters create to others when they lead police on high speed chases to get away for a theft crime. I am not pointing a finger at the police for the pursuit. I am suggesting that if store owners and management would tag ALL of their merchandise the number of these dangerous situations would decline…DRAMATICALLY. But being a person who is sometimes accused of making a point and then driving it into the ground, in this article I am going to discuss other dangers those retailers may be helping contribute to the problem. In a February 9, 2019 news story from abc7ny.com “Alleged Victoria’s Secret shoplifter pepper sprays Long Island police”, a 29 year old woman is accused of trying to steal $1,000 worth of merchandise from Victoria’s Secret. During the investigation and arrest the suspect, “…began kicking, punching, biting and spitting at them.” The suspect also, “sprayed pepper spray at both officers.” The suspect was also charged with being in possession of burglary tools. In nbcphiladelphia.com, November23, 2018, the following story appeared, “Shoplifter Pepper-Sprays Worker Trying to Stop Her Police Say”. According to this story a suspected shoplifter was approached by an employee about merchandise she had concealed in a bag at a Macy’s store. When the employee confronted her she pepper sprayed him. Last, I came across this doozy of a story on ktla.com, Dec. 18. 2018, by Marissa Wenzke, “Target Employee Stabbed by Accused Shoplifter in Pasadena: Police”. In this instance, “A Target employee who confronted someone about allegedly shoplifting at a Pasadena store was stabbed in the leg by the accused thief…” All three of the stores in these news reports carry clothing. Whether that is what the shoplifters were trying to steal is unknown. I would feel confident guessing that was the case in at least the Victoria’s Secret Store and more likely than not in the Macy’s store. What I don’t know is if the merchandise that was being taken was protected with clothing security tags or any form of anti-theft device. Loss Prevention Systems, Inc. recognizes the inherent dangers all shoplifters pose to employees and customers. That is why when they are consulting with clients on matters of shortage reduction and theft prevention one of the most important recommendations they make is that the client use Sensormatic tags and install Sensormatic towers. Shoplifters prefer not to go to stores where aggressive merchandise tagging takes place. They risk picking up merchandise that will cause an alarm and alert store employees. Anti-theft equipment is a deterrent and sends most criminals scurrying to stores where they won’t contend with alarms (or good customer service). Deter these crooks from entering your store and you keep everyone who works for you or shops in your business safer than they would be otherwise. I would further argue, as I did in Part 1, that when stores do NOT use clothing security tags or other devices they are actually contributing to the increased danger their customers and employees face. I am not saying this is intentional as many small retailers are under the false assumption that they cannot afford a Sensormatic system. This is a false assumption and if you happen to be one of those retailers please visit LPSI’s ROI Calculator tab on their website to find out how affordable a system can be. Despite the reasons a retail loss prevention system may not be installed if it isn’t there the shoplifters know and I assure you that they are making you a target for their activity. That means you are helping to create a dangerous workplace. 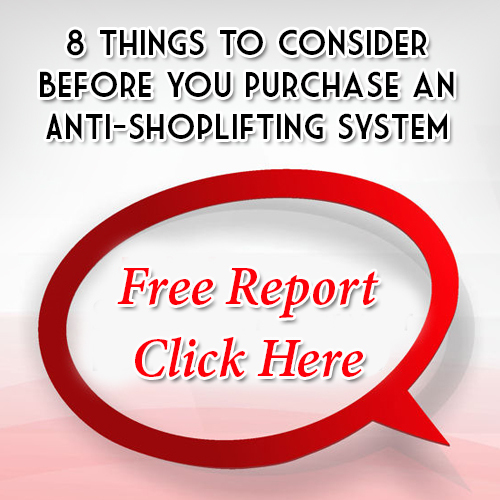 Many shoplifters are violent as you have seen in just a few sample articles. There are many, many more such stories out there and I will share them in future articles. What I hope you realize is most dangerous shoplifting incidents can be avoided through the use of Sensormatic tags and systems and professional training (also provided by LPSI). People want to shop where they feel safe, are you doing all you can to help create that environment in your store? For more information about Sensormatic tags contact us or call 1.866.914.2567.